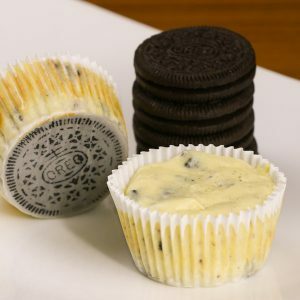 Mini Oreo Cheesecake Cupcakes are a bite-size dessert featuring creamy cheesecake and a hidden oreo on the bottom. They’re easy to make with only six ingredients and versatile enough for parties, birthdays, game day and holidays. They’ll become one of your go-to recipes. Plus video tutorial! 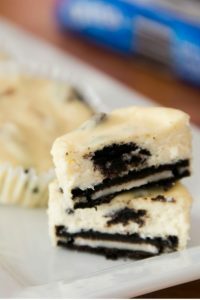 These Mini Oreo Cheesecakes are definitely one of my favorite Oreo desserts along with Oreo Cake. This recipe has already been re-pinned 150,000 times and is catching up to my ever-popular Chocolate Covered Cheesecake Bites. If you want a light and airy baked oreo cheesecake, then this recipe is for you. These oreo cheesecake cupcakes are baked in a low-temperature oven to become fluffy and light. They’re perfect if you want a quick dessert idea to serve up at home. They are particularly good for birthday parties or special occasions like Mother’s Day. We’ve packed them for school lunches and kids just love to show off the hidden oreo on the bottom. 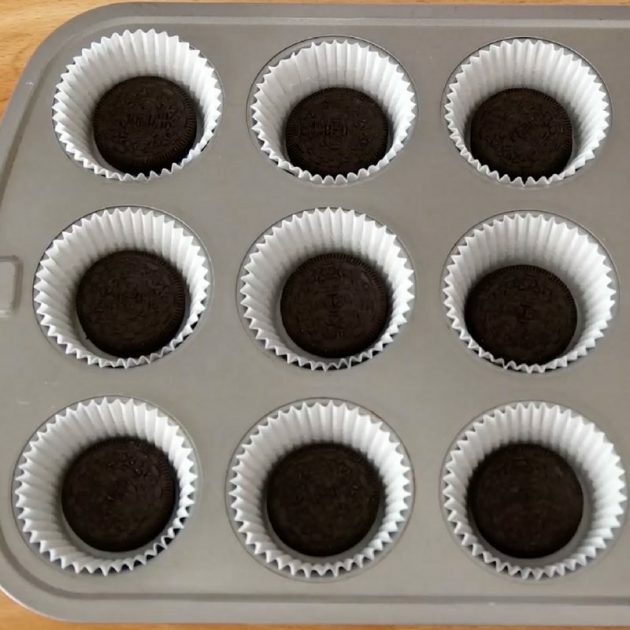 To make this recipe, you’ll need a 12-cup regular muffin pan like this one with some regular size paper cups to fit inside. We recommend white color cups to show off the Oreo hiding in the bottom! Once the cookies are in the paper cups, you can make the homemade cheesecake filling in a mixing bowl. 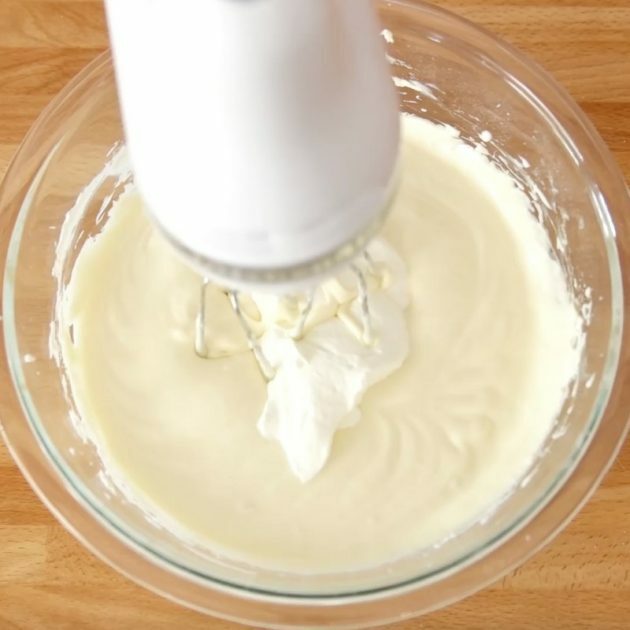 Mix the cream cheese with the rest of the ingredients in a bowl to make the filling. Beating the ingredients together at high speed is what gives the fluffy texture, so get it nice and smooth! We’ve also included crumbled oreo pieces in the filling for extra flavor – don’t worry, they soften up during baking. And into the oven they go to bake for 25-30 minutes at 300°F, a slightly cooler oven than usual. UPDATE: We increased this from 275°F after some of you reported it wasn’t cooking fully at higher altitudes. It’s a balance because going above 300°F can cause the cheesecake to crack and brown on the surface, while cooler may leave it mushy especially if you have a weak oven. An oven thermometer is a handy tool if your oven is not that reliable. They taste so good after being chilled for a few hours, but you can serve them warm out of oven. It’s a great make a head recipe. While any brick cream cheese will do, we always find that fresh cream cheese from the deli counter produces the best flavor. Ensure your cream cheese is softened before mixing – here are tips on how to quickly soften cream cheese. Bake at a lower temperature than usual 275-300°F to get a lighter color and avoid browning or cracking. Here are pictures showing them baked at different temperatures. If you want a substitute for sour cream, greek yogurt or any thick yogurt will work well. To make this recipe lighter and healthier, use light cream cheese and nonfat sour cream. 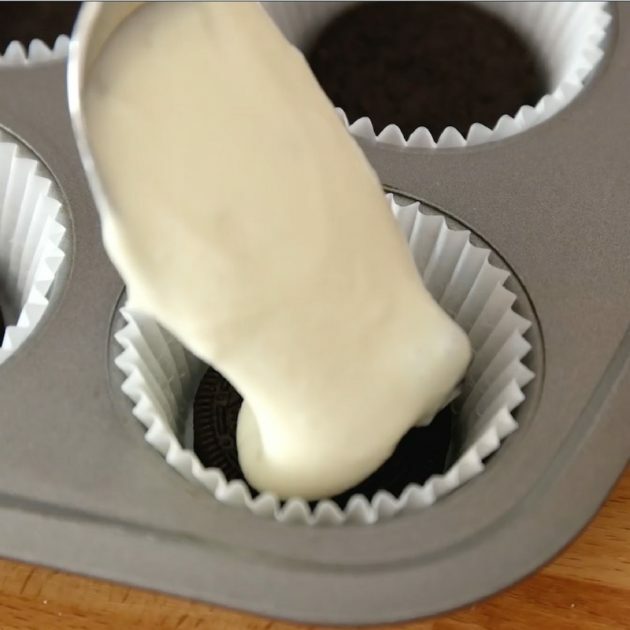 These mini Oreo Cheesecake Cupcakes are creamy and delicious with a hidden Oreo on the bottom. They're easy to make with just 6 ingredients for parties, holidays and birthday celebrations. Preheat oven to 300°F. Line a standard 12-cup muffin pan with paper cups. Place one Oreo cookie into each paper cup. In a medium bowl, beat cream cheese, gradually adding sugar, vanilla, eggs, sour cream, mixing well after each addition. Stir in chopped cookies by hand. Spoon batter into muffin pan, filling each to almost the top. Divide batter evenly among cookie-lined cups, filling each almost to the top. Place in the lower third of the oven and bake for 25-30 minutes until firm in the middle. Remove from oven and transfer to cooling racks. Serve and enjoy! This recipe is not recommended for high-altitude baking based on reader feedback. 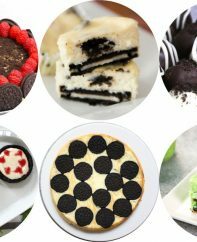 Looking for more oreo cheesecake recipes? Editor note: Originally posted 9/5/2016 and updated on 2/11/2018. I thought this was the coolest idea and I made them. Here is what I found. I live at high altitude so this is a factor. But I had to cook them a lot longer than the recipe stated. And when they were done, I got a less than stellar reception from the fam. They just didn’t set up well and I refrigerated them and still just didn’t hit the mark. I was so excited to make them. Don’t know what could have improved them. I used both chocolate and vanilla oreos. Can I put these in the fridge? The same exact thing happened to me. And I’m in Sacramento…. I followed the recipe to a “t,” except 3 things. I split the 16 ounce cream cheese mix amongst 24 Oreo lined cupcake cups and I used a temp of 305f for 31 minutes. I’m in Hawai‘i and I hate even numbers. I’m making these for 22 little kindergarteners. 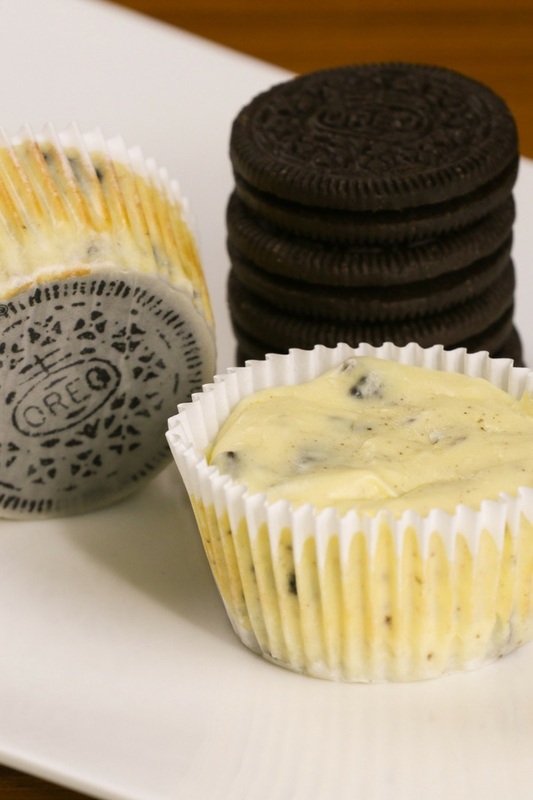 They don’t need big Oreo cheesecake cupcakes. Not sure what it will taste like, but after the class party tomorrow, I will give an update. Hi I am also from Hawaii and was wondering how they turned out and if they were a hit with the kids? I cooked these for 25-30 min at 300 in a convection oven and I live in Utah. They turned out fine. I didn’t put them low in the oven if that made the difference. 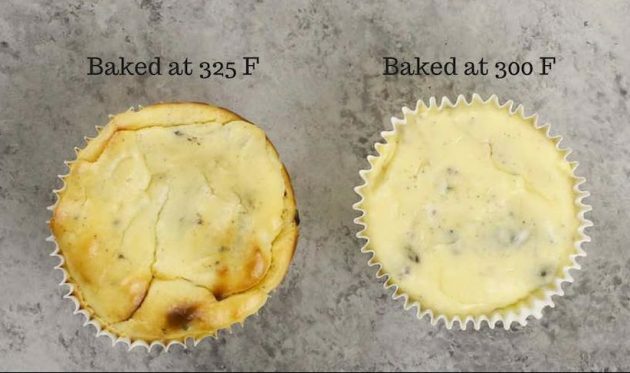 In the initial description you state that it bakes at 275° to prevent browning – but in the recipe it says 300°… before I start I was wondering which temperature I should use? Thanks! 275 worked just fine for me. Everyone loved them. They came out perfectly. Do these need to stay refrigerated if I don’t plan on serving them right away? I just made these & I cooked them at the 325 for 20 minuets. They are very soft. I know cheesecake is soft but I wasn’t sure if they firm up after sitting out. So I baked them 5 more minutes and still soft. Help!? I am not at a high altitude and needed to bake at 325 for 30 mins. Additionally it make in my case 16 cupcakes. Like any cheese cake you have to have some idea what it should look/feel like. Practice makes perfect. Baking is not an exact science. These are delicious and easy to make. I’m making these for my girls night but I have a feeling that I Better make a 2nd batch before my husband gets home! Hello, did you add cooking spray to the tray or anything so it wouldn’t stick? I really want to try to make these for thanksgiving. Thank you so much. Thanks for asking Sandy. The paper cupcake cups prevent any sticking, so no need to spray… Have a great holiday! Hello i followed he recipie and when they were done the lower edges were all brown and a bit crispy. How can i avoid this. Please help. I need these for tomorrow. I’ve seen this before and it’s usually on the paper cups not the cheesecake itself. Just remove the paper and it should look fine! Hi there! I was wondering which setting did you set your hand mixer to whole mixing the ingredients? If I make 24 how much longer do you think they will need to bake? Or the same time for 24? I have made 12 before and they are always a great hit!! I’m wondering if the same cooking instructions would apply to if I made a large cake instead of the cupcake size? Just made them and they turned out fabulously. 5 extra cups too ! Hi! Just wondering how tin foil cupcake holders would work? I used foil and they worked fine – but the sheer holder shows off the cookie base! I used Oreo Lemon cookie – divine. I got more then 12 of them but hopefully they turn out great! Can I use egg replacement? I followed the steps exactly and they were a dud. Was so excited to try it and so disappointed. Hi Joanne, Sorry to hear that, can you tell me what happened exactly? What a great idea with Oreos!! What I do for my mini berry swirl cheesecakes is cook them, then turn the oven off and let them sit in the oven about 20-30 minutes more. This helps set them. But, an oven thermometer is a must, because everyone’s oven is different! I made these for my children as a weekend treat. They were a big hit. And they have requested them again for next weekends treat! These look like spectacular little oreo treats! I just had a DQ Oreo blizzard yesterday and now I am on an Oreo kick. And a dessert kick. I guess this is most of the time, though. Thanks for your review Ben, glad you like them! Great tip about using white liners to really show off the whole oreo on the bottom! These are tasty and I found the side-by-side comparison pics of the two different cooking temperatures really interesting! Great recipe! I’ll try making these with my kids next time we bake something together. OMG! These are brilliant. I love that you used a cookie for the crust! Great advice about cooking at a lower temperature. Those are so cute! I’m sure they’re a hit at a children’s party – kids like little single serving pieces anyway, and these are even better! 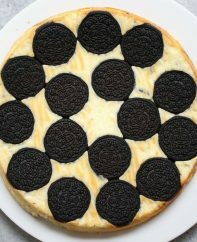 Wonderful combo of Oreos and cheesecake!! My dad LOVES Oreo cookies so I think I’ll just have to make these for him! 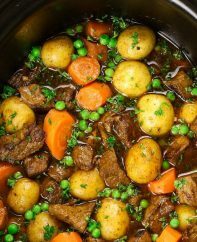 If I wanted to make these as a whole in a pan, would the cooking times still be the same or would you recommended cooking them for longer? If it helps, I’m making these in Hawai’i. Made it for a friend’s birthday party, my 1st time making cheesecake. They turned out great! I am in Louisiana, bake 20 at 295 for 28 minutes! These turned out fabulous despite my missing the lower baking temp and white liner suggestions. I baked for 22mins at 350F in convection oven. Recipe made 18, probably because I used extra 4 crushed Oreos in the batter. Thanks! Thanks for your review Connie and glad you enjoyed them! This is my second time making them, first time they were great, except my mixture for some reason was lumpy. I used my kitchen aid. This time I used a hand mixer and it was a lot smoother. I just came back to the site to read if anyone else had any lumps and realized I didn’t put the sour cream in this batch! Oops! They are still delish! ?? I made these and most of them cracked. Can you tell me why. Did I possibly overfill my cups. I did need to cook them 15 minutes longer. I just made these at 160c for 30 mins and 130c for 10 mins, and they melt in your mouth! Amazing recipe, so easy, so delicious. Thank you for sharing! I did have to add 3 more chopped Oreos and mine were a little more golden, but otherwise perfect! Thanks for your comment Adam – sounds amazing! If I froze these the night before would it be ok to not refrigerate them if I was serving them mid afternoon? Hi Michelle, I think so as long as it’s not a heat wave 🙂 Let me know how they turned out! I’m basically doubling the baking time. They are still in the oven. I kinda eyed the recipe when it came to the sour cream, though I thought I put less than needed. I used the double stuffed oreos so I’m not sure if that’s effecting it too. I might update how long it actually takes for them to be firm in the middle. Hi Brenda, Thanks for your question and sorry it’s taking longer. The extra sour cream is probably the cause and not the Double Stuf. Hope it turned out for you! Michelle, LOL is right, they changed my life too 🙂 Thanks for your review and feedback! But i like more when you crumble the oreo cookies to make the crust. Hi Jordan, That sounds correct – a single recipe will make 12 cupcakes and doubling it would do 24. How did they turn out? I made these today I was so excited , but it did not work out for me ! I think the 275f was too much it got burned within 15 min became brown & cracked .. should I make it 200f next time ? . Are they supposed to firm up when cooling? I followed the receipe exactly and they did not cook. I had them in the oven at 300 degrees for 35 minutes and still seem raw in the middle. Not sure what to do. Could I use silicone cupcake liners or will they stick? Hi Laurie, They’re awesome for potlucks. You can chill in the fridge for up to 2 days, or freeze for up to 3 months. Just use an airtight container or ziplock bag. Enjoy!